The Barbie Blog: Can't Pass It Up! Remember in my last post how I talked about how I had nothing new to throw up in a blog post? So, I was browsing through Facebook the other day and I saw someone who was selling this doll. Not JUST this doll but a few others too. And I had to inquire. She is a fellow collector and she had a total of 7 dolls that she gave me a killer deal on. 7 dolls for $55! This is the 50th Anniversary Barbie "Generations of Dreams." 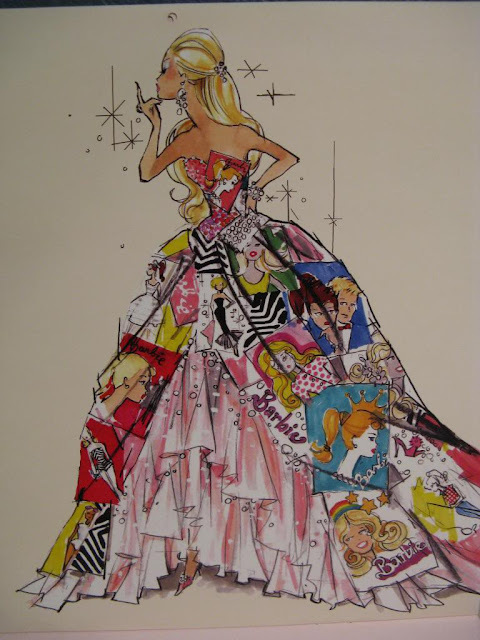 Designed by the master of Barbie Haute Couture, Robert Best! The box didn't look 'boxed but deboxed' friendly but then I spotted this on the side. Uh-Oh. Now I need to take her out to make sure that there is no damage to the dress by silverfish. There is no damage to the dress thank goodness. But just LOOK at her! But I love this pink sparkly part of her dress! Beautiful! And there are pictures that are outlined in sequins. There is Red Flare right at the bottom! This dress is just so amazing! All the pictures of Barbie through the years. I had this one on one of those posters to color that you get with the markers. One of my favorite images of Barbie! Here is the other side of the dress. She wears pastel pink open toe heels. I didn't get a picture of the back of the box but has the Robert Best drawing and it reads: "50 Years of trends and fashion, couture and dreams for the girl in all of us-and for the woman we might become! Barbie doll remains always stylish, always evolving, always reflecting the beauty that is within every one of us, radiating for all to see! Generations of Dreams Barbie doll captures our favorite doll, dressed in an exquisite gown embellished with the illustrations of the Barbie heritage. Decorated with silvery sequins, the gown is as bright as our hopes and wishes. Generations of Dreams Barbie doll commemorates 50 years of inspired dreams!" There is also a little 50th Anniversary tag up at the top of the box. I wish I had two so I could take her out and display her dress in all its glory. But, no. I told the seller that I was a collector and would keep them nice and pristine. She was happy. And happy they were going to a good home! And I am happy because I have one of the dolls on my wish list. 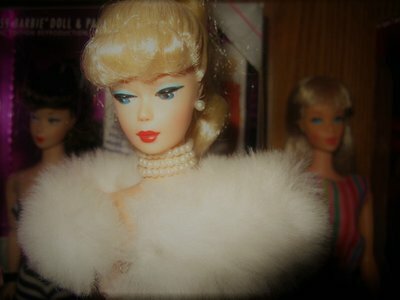 Friends, do you have Generations of Dreams Barbie in your collection? Love or hate her dress? Let me know in the comments below! Oh Teresa! I am very happy for you! I have gotten a few vintage (to me vintage is 60s-70) treasures too. I like her dress, minus the bugs. Not a fan of the open mouth smile though. I prefer the more demure closed lips ones. Love the lip stick though and yes, rooted eyelashes would have been more in keeping with a collector doll.